Homebuyers now have more time to buy a new Atlanta home and get great deals! 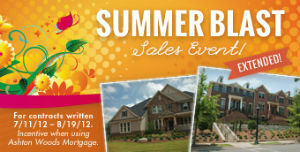 Ashton Woods Homes is extending its Summer Blast Sales Event until August 19, 2012. * Buyers will receive a FREE six month interest rate lock and $5,000 in closing costs as part of the fabulous incentives with this event! This entry was posted in Energy Efficient, Green News, News and tagged ashton woods homes, Atlanta homes, Energy Efficient, Notting Hill, West Forsyth on August 10, 2012 by Carol Morgan.